Seems I’m not the only who likes to make their own organic gluten free jams and jellies. Barbara is a dear lady that I met at the GIG convention. She heads up the Twin Cities GIG gluten free chapter there. ( Another reason to go to conventions: you get to meet all these great people:). She sent me some of her tried and true recipes. They sound wonderful. I can smell the pear sauce right now! I just spent the entire day yesterday making pear sauce – I am allergic to formaldehyde and apples create their own. 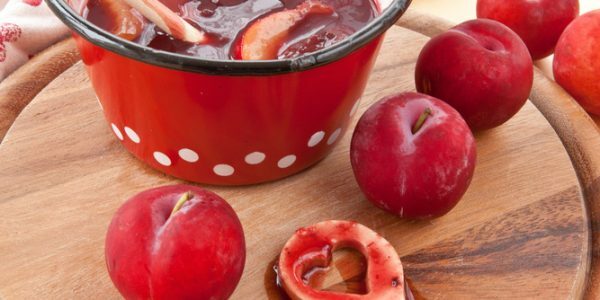 I use pear or plum sauce for apple sauce and pear or pineapple juice instead of apple juice. I make all my own jams too, can’t have pectin). I use honey instead of sugar and I use tapioca starch instead of pectin to thicken them. I just heat a little pear or pineapple juice and add the tapioca starch to it (kinda like making a rue) once the juice is thickened I add it to the honey-ed fruit and put it into jars for freezer jam. I don’t make a lot of cooked jellies, but I use the same method and then add the thickened juice to the hot fruit then can as usual. Peel, core, and slice the pears into small pieces. I usually fit 16 pears into a 4 qt heavy duty dutch oven. Sprinkle the tapioca starch over the sliced pears, if using. Add 3 cups of pear juice. Boil the heck out it until it thickens and the pears are tender. Puree in the blender for a bit to get it all smooth and then fill hot jars leaving a 1/2 inch head space. Boil the filled jars for 20-25 mins. and then allow them to cool on the counter. Once the tops are popped and they are completely cool, they can be shelved for future use. Makes about 14 qt jars. If you want a refresher course on Boiling Water Bath Canning: go here! Plum Sauce – really great with recipes using chocolate, adds a little depth the pear sauce lacks. Blanch, peel, core, and slice the plums into small pieces. I usually fit 20 plums into a 4 qt heavy duty dutch oven. Sprinkle the tapioca starch over the sliced plums, if using.Boil the heck out it until it thickens and the plums are tender. Puree in the blender for a bit to get it all smooth and then fill hot jars leaving a 1/2 inch head space. Boil the filled jars for 20-25 mins and then allow them to cool on the counter. Once the tops are popped and they are completely cool, they can be shelved for future use. Makes about 11 qt jars. In my baking, I use GHEE for all fats. If a recipe calls for BUTTER use half the amount of GHEE and replace the other half with fruit sauce. If a recipes calls for OIL use the same amount of GHEE. If a recipe calls for LARD/SHORTENING use cold GHEE in the same amount. Ghee is expensive to purchase, but extremely easy to make. Unwrap the butter and squeeze it into the pan (upright works best). cover the pan and set it on a medium high heat. check it every so often and give it a small stir to prevent it from foaming over the top of the pan. Otherwise let it boil for about 45 minutes without messing with it. It is done when there is no steam rising from the pot and the butter fat is all at the bottom of the pan. Boil six pint size jars and lids. Strain the GHEE into the jars through the sieve and cheesecloth leaving a 1/2 inch head space. As soon as a jar is filled put the cover on it and set it aside – the jar will get very hot so handle it with pot holders. Once the jars are filled and slightly cooled place them in the fridge for a couple hours. This helps to make the color uniform throughout. Once cooled, put them on the pantry shelf. GHEE has no water or butter fat in it, so it will not mold unless water is reintroduced into the jar. GHEE contains no lactose or Casein, if you do not get any of the butter fat into the jar while filling. GHEE has little or no cholesterol. Always use a clean knife/spoon to serve up GHEE. Do not leave the jar open on the counter as it will absorb water and get moldy. GHEE will keep on the pantry shelf for up to one year without refrigeration and should be used within a month after opening the jar. GHEE is a high temp oil, it will not smoke even when used for high temp applications like stir fry. I use it for everything. It adds the taste and scent of butter without any of the negative issues of butter. Try making a batch and see how easy it is. Remember though, watch it, don’t stir it and “mess” with it as it cooks; if it is left alone it will turn out better. You can feel free to share these in the newsletter if you wish, they are trial and error recipes so I would rather share them than have others go through the expensive errors I had. I hope Barbara has inspired you to try making your own sauces, jams and jellies. And don’t forget to get to the nearest convention.